Tip 69- Gas Got You Down? I had a client who got bloated and gassy every time he ate lunch at his company’s cafeteria. My first thought was probably what you’re thinking, “Eat somewhere else for lunch!” But after asking him a few questions, he told me that he drank 2 water bottles (16 ounces each) during lunch. I explained that too much fluid in your gut during a meal will dilute your stomach acid. Without stomach acid your digestion will all but stop. The food sits in your gut causing gas and bloating. Staying hydrated is important. But don’t look at meal times as a way to get all your water in. It’s fine to drink a bottle of water an hour before or after a meal. But during a meal, take small sips. You will preserve your stomach acid, food will digest easier, and your co-workers will thank you. I get this question almost every time I lecture. You’ve heard the advice about drinking eight 8-ounce glasses of water daily about a billion times in your life, right? There’s actually no magic (or science) to this number. The right amount of water consumption varies according to your activity level and size. If you want, just drink enough water so that your urine is clear. Today’s tip: Here are some good digestion tips to practice. Slow down while eating. If you gulp your food (or drink) you will take in a lot of air, causing bloating. 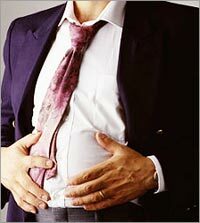 Carbonated drinks can also cause bloating. Consider taking probiotics (the good bacteria in yogurt), they can help to strengthen your stomach and can, in the long run, help your digestion get back on track.